Keeping the kids off the streets during school holidays can be a tricky prospect, so here's entertainment editor John Turnbull lending a hand by recommending some big-screen blockbusters to keep the family entertained. But I digress. After years of making dark, depressing movies like Batman vs Superman, Warner/DC have finally realized that most viewers actually want to have fun when they’re watching a comic book movie. The trend started with Wonder Woman, but has been fully embraced with Shazam, which is surely one of the most positive and uplifting superhero movies of the last ten years. Shazam tells the story of orphan Billy Batson (Asher Angel, who bears a striking resemblance to Maisie Williams), a resourceful young man on the hunt for the mother that abandoned him. During his search, Billy meets the wizard Shazam and, after demonstrating his worthiness, is given god-like powers. The rest of the movie is basically Billy learning about his powers, assisted by his new adoptive family, particularly his room-mate Freddy Freeman (Jack Dylan Grazer). While this might sound like a big-screen version of The Greatest American Hero, Shazam manages to hit the perfect balance between superhero action and family dynamics — you genuinely care about what happens to Billy’s adoptive brothers and sisters,and can’t help but smile when the final reveal occurs. The villain of the piece is Dr Sivana, played with relish by serial bad guy Mark Strong. In an era when many super-villains are CGI monstrosities, Strong brings a compelling layer of humanity to Sivana, spending his whole life searching for the opportunity he was offered as a child, and lost due to his weakness and greed. Strong’s performance is representative of the movie as a whole — a lot of humanity, a lot of heart and characters you genuinely care about. 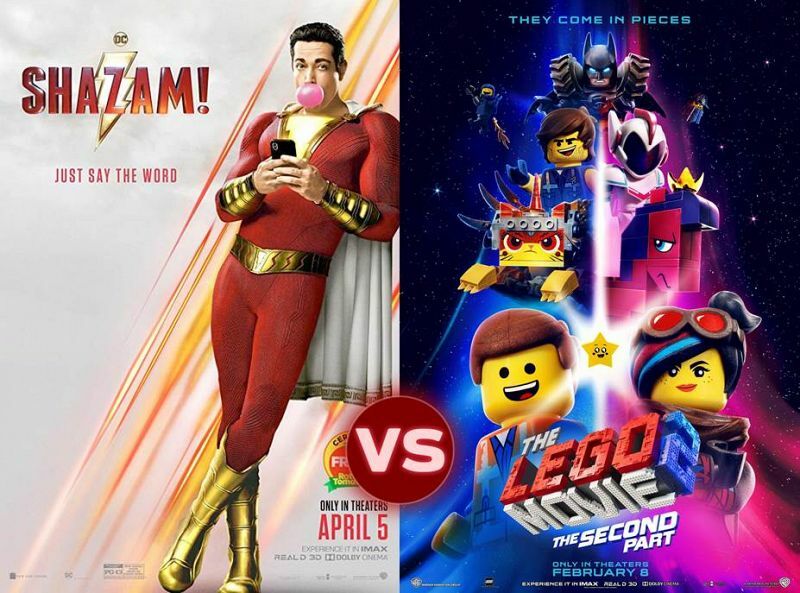 It would be very easy to talk about sequels and the law of diminishing returns when discussing the Lego Movie sequel. Set five years after the original, the Lego world inhabited by Emmet (Chris Pratt), Wyldstyle (Elizabeth Banks) and Lego Batman (Will Arnett) has turned into a post-apocalyptic wasteland, with costumes heavily inspired by Mad Max: Fury Road. Naturally, the eternally optimistic Emmet remains unaffected, but it’s clear that the world around him has gone bad. Derided pre-release as an unashamed commercial for toys, the original Lego Movie turned out to have a lot of heart and a positive message about believing in yourself. The sequel follows a similar path, but feels the need to throw as many pop-culture references at the screen as possible – are there really many kids (or indeed adults) who will appreciate a joke about US Supreme Court judge Ruth Bader Ginsberg? From a plot perspective, The Lego Movie 2 tells the story of Emmet’s meeting with Rex Dangervest (also Chris Pratt), a charismatic individual with great hair and a 3-day growth. As Rex introduces Emmet to his hedonistic lifestyle, our hero gradually realizes the importance of loyalty and the value of good friends, but will it be in time to save the Lego universe? Much like the first movie, the sequel plays with cinematic techniques to approximate the feeling of kids at play, and occasionally cuts to live-action humans to remind viewers that all of the action is happening in the heads of children – or is it? This uncertainty adds a layer of intrigue to what is essentially a fairly straightforward movie and will appeal to parents with the "play nicely with your brother/sister" message that wraps up the flick. With the cost of taking a family to the movies rapidly approaching $100, it’s important that you don’t waste your precious time and money. While neither of these films fall into the "complete waste of resources" category, it’s fair to say that one is far better than the other. If you have young kids or are one of those people with an enduring love of Lego, (to the point that you’ve constructed Lego as an adult with no children involved), then The Lego Movie 2: The Second Part is probably a good choice. If, on the other hand, you’re in the mood for a superhero movie that will make you think about the nature of heroism, while bringing a big smile to your face, then Shazam comes highly recommended. Honestly, it’s delightful.